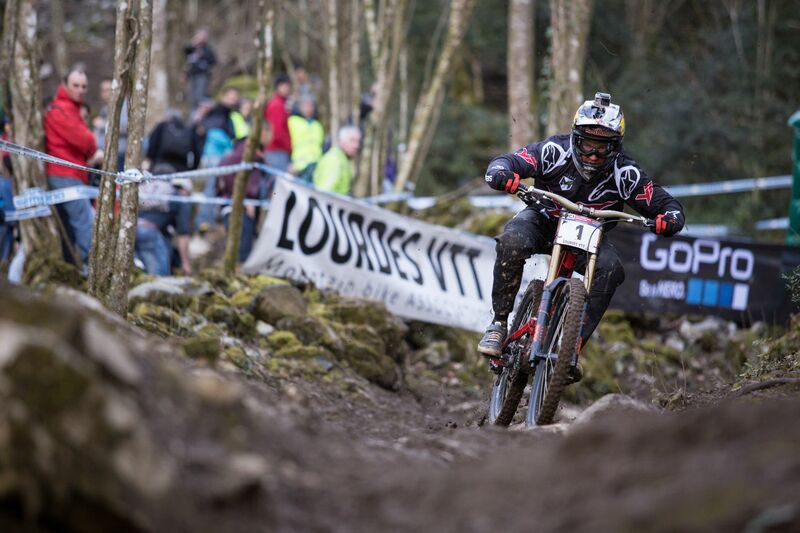 Reigning World Cup Champion Aaron Gwin scored a historic win for his new team's title sponsor, YT Industries, by taking their TUES CF Downhill bike to a maiden victory on the slopes of the Pyrenees on the outskirts of Lourdes France. 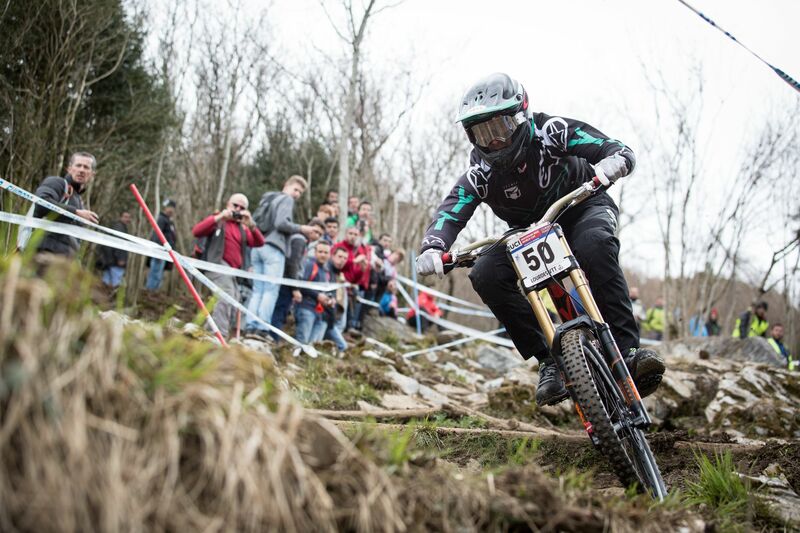 The opening round of the UCI Mountain Bike World Cup, the 24th season of the series, presented plenty of challenges throughout the week due to changeable weather conditions. Despite the sunny weather on race day, threats of a looming storm late in the afternoon certainly gave everyone something to think about as Aaron went up the hill to start his race. His win last year on this course was in extremely dry and dusty conditions, far from today's track conditions, so to walk away with a podium result would have been a great start for the new team. After the first split it was clear that Aaron was on a great run, building on his lead throughout each of the 4 sectors before finally crossing the line with a 3m 09.131secs, some 2.7secs faster than previous fastest Danny Hart (GBR). Nine riders were left to come down but all eyes were waiting on crowd favourite and World Champion, Loic Bruni of France. Bruni was showing incredible pace and was up on the first 3 splits but a small mistake was a sign of things to come as he pushed a little too hard towards the bottom and came off his bike. The win was Aaron's. 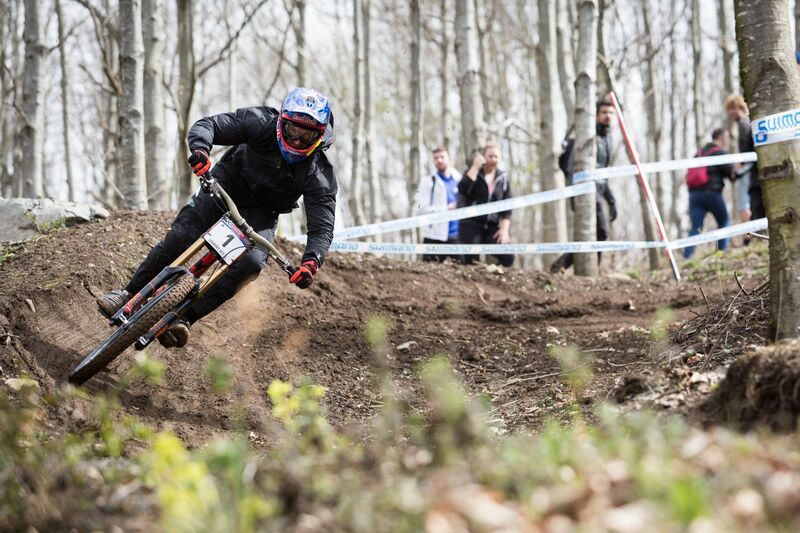 In fact, this was Aaron's 50th World Cup start, his 30th podium, of which 15 have been wins. "I'm so stoked to win the first round of the year with the new team. This week was especially challenging for everyone on the mountain due to the changing weather conditions, nearly every run was different, so to have it all come together on race day is really cool. I want to say a big thank you to the team staff, everyone at YT, and all of our team sponsors. We put in a ton of work in the off-season to get us ready for the races and it's awesome to see it all come together so well. Really looking forward to the rest of the season; this was a great start and I believe we'll continue to get stronger from here!" Aaron's team mate Angel Suarez had a tough week and after a heavy crash on a Saturday practice run and was suffering from a sore back. Unable to complete his second practice run he went straight into qualifying but was unable to ride at his limit and just missed out on the top 80.